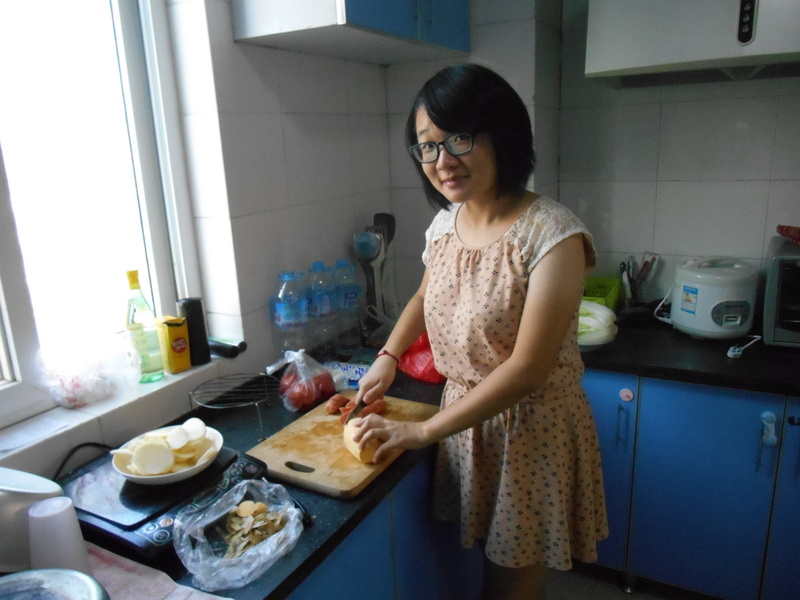 This week I had the opportunity to have a couple students over to teach me how to cook Chinese food. 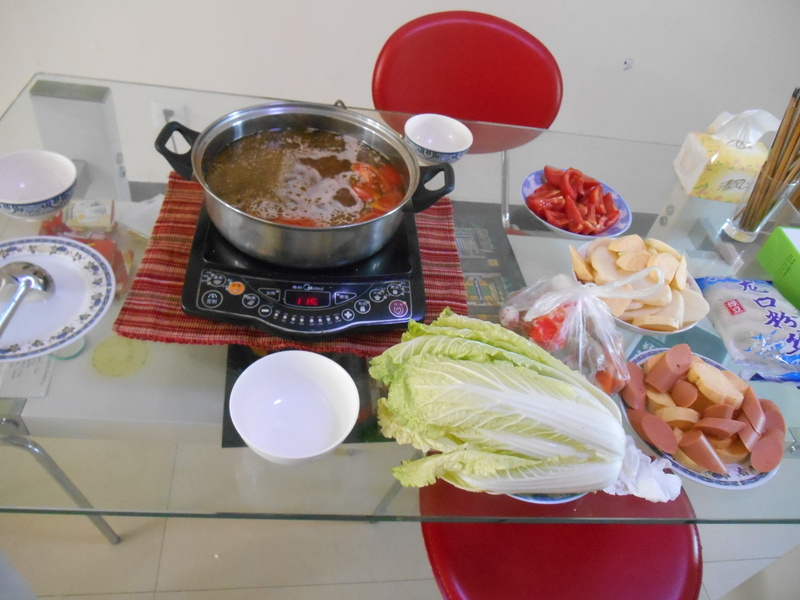 On the menu this week was hotpot. It’s a traditional dish equivalent to fondu in the States. It was was surprisingly easy and delicious. We began by meeting at the vegetable market on campus where the girls showed me which vegetable, meat and spice vendors they prefer. They named several strange vegetables that I pointed to including several types of chinese cabbage, squash, egg plants and green beans. We bought a ton of food. That’s a thing in China by the way, you always make more food than you can eat and never empty your bowl all the way. Turn hotplate on. Place seasoning packet into empty pot. Add boiling water from electric water boiler. Stir til well blended. Allow pot to come to a rolling boil then begin adding vegetables, several at a time. When they look cooked (which should only take a couple minutes or so), poke around with you chop sticks until you find something you prefer. Eat it all in one bite. Once the vegetables have started to cook, add the meats. That way something is ready to eat while the rest is cooking and the pot does not get too full. Be sure to slurp your noodles if you can’t get the entire bite into your mouth on one try. * On a side note, the broth is usually not eaten only used for flavoring. A Chinese dumpling. They are delicious. I am not Chinese. Thanks for the correction. I think you are right…it does sound like an american version of fondue….yum! Have you received any mail? Also, are there any changes or additions for your mailing address you gave us before you left? I have not received any mail yet. It should go straight to the administration office and thy will call me to pick it up. So far I haven’t seen anything. I will ask Edwin and Mary how it works exactly. Also, The big address label I gave you should be correct (with chinese and english). I have gotten my prescriptions worked out. They are going to mail everything directly to Mom and Dad so you shouldn’t have to do anything. I didn’t think the pharmacy would mail outi-of-state but they said it won’t be a problem. Other thatn that everything is going really well. Yesterday was Mid-Autumn Festival and I went to the Yellow Crain Tower. It’s really famous here in Wuhan.